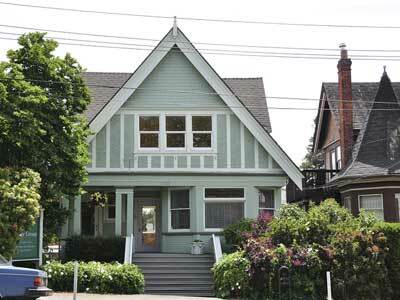 This is an example of David Herbert Bale’s (1402 Stadacona Av, Fernwood) best version of the Edwardian Vernacular Arts & Crafts 1½-storey residence. Other almost identical houses still stand at 1017 Catherine St (Vic West), 2101 Chambers, 2586 Cook, 1049 Richmond and 2412 Wark, as well as the third house in this Fort St Bantly family compound, 1121, second to the right. Bale built his last known house of this design at 3571 Calumet Av in Saanich in 1919. All these houses have the typical EVA&C front-facing gable with symmetrical upper floor over asymmetrical main floor on the front façade, inset corner front porch balanced by an angled bay, and gabled dormers on either side of the roof. What distinguishes this version by Bale is the relatively steep slope of the roof, the well-proportioned break in the front gable, with shingles above roughcast stucco and half-timbering, and the handsome double and triple porch posts under rectangular combined capitals. The upper windows were replaced with vinyl sash in 2002, and the too-small finial on the front is likely an addition, as the other examples of this design all have smoothly elegant bargeboards with no interruptions. The main variation in the different houses are the front steps and balustrades. The Bantly family lived at what is now 851 Fort for 14 years until Anna’s husband Marcus (c.1848-1906) died. Born in Württemberg, Germany, he came to Victoria via California in 1883 with Anna (Grimm, 1848-1912) and their children. Marcus was the proprietor of a cigar factory at 851 Fort, which he operated until his death. He was well-known in Victoria music circles for his skill on the clarinet and violin and as a singer. His sons Simon Anton “Tony” (1874-1923) and Benedict (1878-1961) and daughter Rosina (1875-1942) were also musicians. They formed a popular local dance band, and became leading musicians in the Victoria cultural community. Bale also designed and built the tower house in the centre of this grouping in 1909 for Anna’s son, music teacher Ben Bantly and his wife Johanna (Mensinger). Ben and his family moved to Hollywood in the 1920s and he played music for Mary Pickford’s movies. The third house, 1121 Fort, Bale built for her son Tony Bantly in 1909 when he married Frances Lipsky. 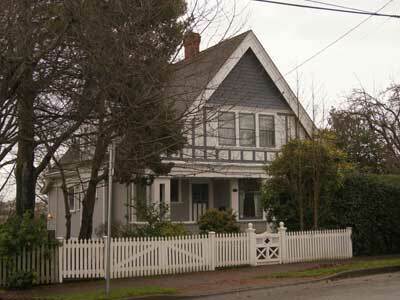 However, they moved in 1912 to a larger house Bale did for them at 605 Trutch St (Fairfield). Daughter Rosina Mellor, widow of John William Mellor (1868-1913), lived here until 1920. She had previously lived at 916 Pandora Av (North Park). Various tenants occupied the house over the next several decades, including a number of widows. Two carpenters, Daniel Campbell and James Ross, lived here in the early and mid-1920s, respectively. Esther Catherine (Armour, 1871-1935) Minnie, widow of Edward Minnie (1868-1924) lived here in 1929 with her daughter Mary. This house was vacant for several years during the 1930s, but Emily Frances Crotovitch (Calay, 1879-1973), widow of Nicifor G. Crotovitch (1885-1930) lived here in the mid-1930s. Nicifor was a Russian-born logger, who married English-born Emily in Victoria in 1926. Mrs Florence Samway, widow of Charles Samway, lived here with her daughter Ethel in 1939. During the 1940s this became a rooming house with various owners over the years. Mrs Alice Post, a widow, was here in 1941. Stanley and Nellie Page were here in 1943. Stanley was employed at Yarrows Shipyard. From c.1946-49 HMC Dockyard machinist Arthur Midlane and his wife Leah lived here. By 1951, Charles Carl Henry (1890-1966) and Muriel Norine (Fendey, 1901-1980) Utas were living here. Charles was an engineer with the Moore-Whittington Lumber Co. The Utas family came to BC from Alberta c.1945 and lived at 130 Government St (James Bay) briefly before buying this house. In the early 1980s this became a tearoom. Owner / manager Marilyn Pollard and her family won a 1984 Hallmark Society Award for the restoration of the interior, and Grant Sheldrake won another for restoration of the exterior. It is now owned by a law firm.